I have to tell you, I’m not really a potato salad kind of girl. That doesn’t stop me from piling a big helping on my plate at every picnic and barbecue though. The thing is, I love potatoes and I really want to love potato salad. But it always seems bland and boring to me. I usually resort to the extra processed and sugary kind that you get in a tub at the grocery store. You know, the kind that will last 6 years in your refrigerator. Okay, maybe not that long. But I know its full of processed dressing, sugar, and fat and it’s really not that healthy. So the other day I got a craving for potatoes and decided I was going to try a new potato salad recipe. I scoured some various blogs and looked through Pinterest but nothing seemed like it would create the taste I was longing for. So I decided I was going to experiment. I’m pretty darn proud of myself because this is what I came up with on my very first try. I’d like to just say I’m just that good . . . but really I think I always knew what my taste buds were craving and deep down I already had the recipe in my head. Those of you who know me will know this is right up my alley. I have been jokingly referred to as the garlic girl. When we play a game of Pictionary and garlic or any type of food that can have garlic in it is in the picture, the person will always point to me like I am the one making it and all at once the entire crowd will yell “Garlic!”. True story. Really. You know the saying, “Bacon makes everything better”? Yeah, my food mantra is “garlic makes everything better”. And in this case, it really is true. I finally have a potato salad that I LOVE and I think you’ll enjoy it too. There is no icky mayonnaise in it. You are using raw ingredients in the dressing that pack a lot of healthy benefits especially when they are not cooked. This includes cold pressed extra virgin olive oil, rosemary, and garlic. Fresh rosemary has healthy essential oils that are lost in cooking. Fresh rosemary also has 25% more manganese than dried. Did you know that rosemary also contains fiber, iron and calcium? For more rosemary facts check out this site: Rosemary Facts. Garlic contains an abundance of cancer and cardio protective properties. It’s also chock full of manganese, Vitamins B6, B1, C and selenium, calcium, and tryptophan… the list goes on and on. Yes, garlic IS your BEST friend . . . but you may not have too many friends if you eat tons of it. If this turns out to be your situation, no worries . . . you’ll live much longer than all your anti-garlic friends and then you can get new ones. More fun garlic fact here. 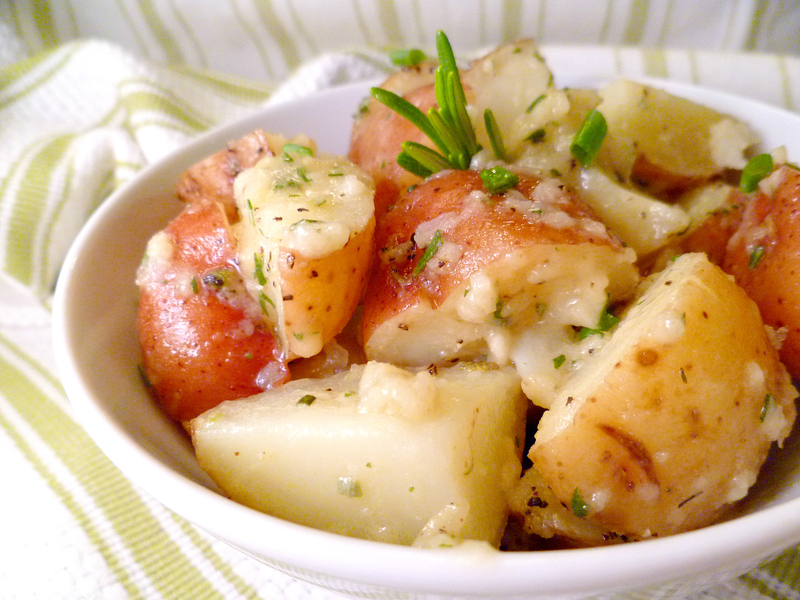 Cut up potatoes into quarters or about 1/2-3/4 inch chunks (see footnotes). Put in a large pot of warm water and bring to a boil. When potatoes can easily be pierced with a fork (about 15-20 minutes), turn off the heat and drain the water in a colander. Let the potatoes sit for a few minutes to drain then put into a large serving bowl. Set aside. In a small bowl whisk the remaining ingredients until the oil is emulsified. Pour the dressing over the potatoes and gently stir to combine. Dash a few good shakes of pepper over it and if you used unseasoned rice vinegar instead of seasoned, you may need some salt too (see footnotes). You can serve immediately or cover and put into the refrigerator. These get better as they sit and taste great a day or two later! Footnotes: Leave the skins on the potatoes. If you boil them just right, the skins won’t fall off and they are really pretty in the salad. Baby red potatoes can be a variety of sizes. I usually cut the small round ones into quarters but if they are bigger, you may want to cut them a little smaller. I usually quarter the larger ones then halve each quarter. 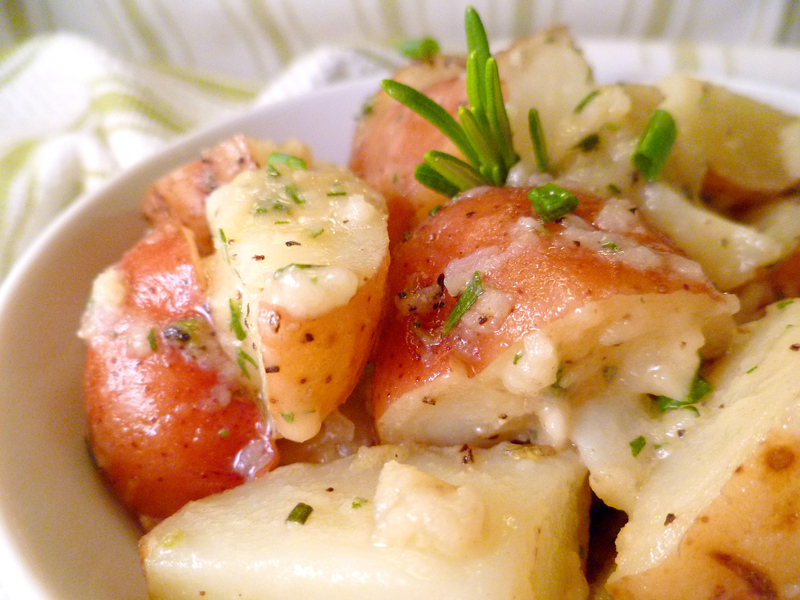 Red potatoes do not break down as quickly when boiled like some other varieties. Therefore the size you cut them to will be the size they end up in your dish. I used about 2 1/2 lbs for this amount of dressing but you don’t have to be exact and you can always make extra dressing if needed. Note that I used seasoned rice vinegar which contains added salt and sugar. If you use regular rice vinegar you may need to add a touch of honey or agave and some extra salt. Please use a garlic mincer to mince your garlic on this. Finely chopping your garlic will not get the same result. When you use a mincer you get all the garlic juices into the dressing and that adds a lot of extra flavor. looks super yummy!! I’m hungry now!!! I’m more of a roast potatoes kinda girl myself…but this salad looks truly fresh and yummy, love rosemary and garlic, my favorite flavor combination:) must try! That’s exactly it for me too. I love roasted potatoes as well. And you’re right on with this… it’s fresh with that garlicky goodness that gives it that spike of flavor. I love quick and easy recipes, and this was super easy and delicious. Thanks for sharing this great recipe. Thank you! I am so glad you found it easy and better yet, delicious! Thanks for sharing that. These look amazing, I want to try them. Also totally know what you mean about potato salad being boring and bland but still finding you’ve piled your plate high with it. 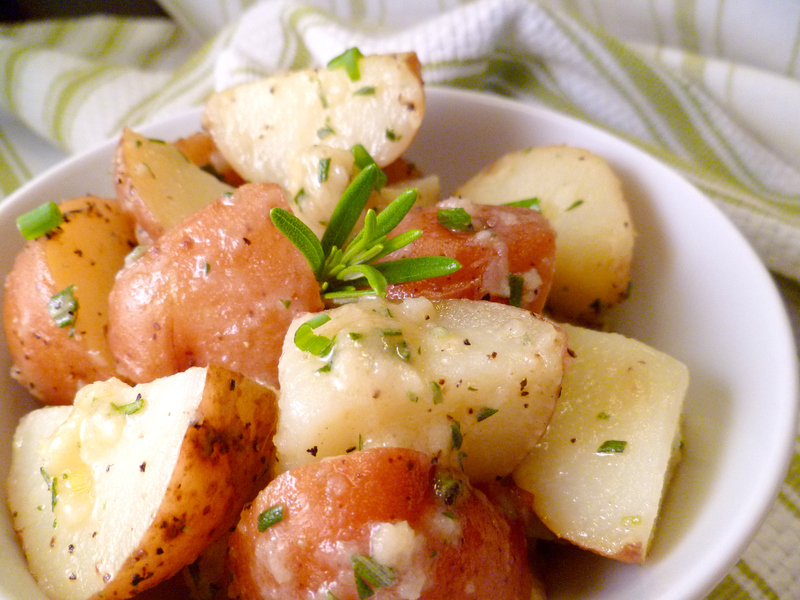 Garlic potatoes: the way forward.